Bariatric surgery definition- is related to weight loss by a surgery and risks. This surgery is very helpful for an overweight or obese individual. Individual who is overweight or obese, and then they face many serious health problems. If anyone who has 100 or more than 100 pounds over their normal weight may face heart problem, diabetes problem, joint problem, and sleep apnea problem. So, for fixing overweight or obese problems medical science developed a bariatric surgery for weight loss. For this individual needs to work hard before and after the surgery with following advice of a doctor. The other name of gastric sleeve surgery is vertical sleeve gastrectomy and it is a most common procedure of weight loss. In this surgery procedure, a part of the stomach removes from original by a surgeon. The remaining part of the stomach is a shape of a banana and that banana-shaped stomach close with stapling. This remaining banana-shaped stomach much smaller than original. In this procedure of surgery, individual will eat less, feel full sooner, and be less hungry. 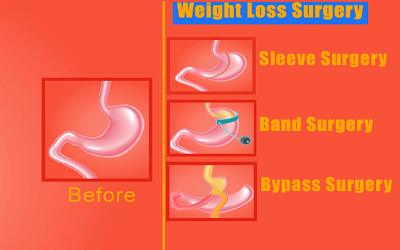 Gastric sleeve surgery weight loss takes place greater than gastric band surgery. In this surgery, approximately 80% stomach removes from an original. This surgery is not a reversed surgery and this surgery has a chance of vitamin shortage. This surgery have surgery related to some problems with respect to gastric band surgery, also it has a chance of acid reflux. The other name of gastric bypass surgery is “Roux-en-Y” gastric bypass surgery. It is two parts surgery. In the first part, for developing a small pouch in the upper part of the stomach with stapling the stomach by a surgeon. With stapling you get much smaller stomach, therefore you eat less and feel full sooner. In the second part, the surgeon attaches the small pouch to the middle section of the small intestine and bypassing the upper part of the small intestine. In this surgery, individual loss weight more than gastric sleeve surgery and also in this method individual loss weight greater than gastric band surgery. It is difficult to reverse in gastric bypass surgery and have a higher chance in a shortage of vitamins than gastric sleeve or gastric band surgery. In gastric band surgery, a small pouch creates by putting an adjustable silicone band around the stomach top section. This adjustable silicone band attached to a device port under the skin of an individual. For tightening or loosening the silicon band, surgeon adjusts the pouch size by device port. This surgery has fewer problems as compared to sleeve surgery and bypass surgery. For individuals younger than 18 years, gastric band device is not approved by FDA. Gastric band surgery is an adjustable and reversible surgery and has the lowest chance of vitamin shortage. In this surgery, less weight loss as compared to other kinds of weight loss surgery. Weight loss depends on the individual and on bariatric surgery type. A study shows that If an individual wants to lose average weight 45 pounds then gastric band surgery is suitable and if an individual wants to lose average weight 90 pounds then gastric bypass surgery is better. It is expected that individual that want to bariatric surgery or weight loss surgery for weight loss, then he contact a dietitian, psychiatrist, internist, and a bariatric surgeon. Before surgery, medical history, physical exam, and order blood tests take place. In a situation of smoking, you need to prohibit that at least 6 weeks before of surgery. For bariatric surgery, type depends on you. After surgery, a dietitian will explain to you that how much diet and drink required for you. In case of bariatric surgery option, psychiatrist or psychologist may do an assessment. It is recommended that you need to rest and use prescribed supplements for getting enough vitamins and minerals. In the case of physical activity, you can do that safely which is advice by your doctor. In the case of diet and drink, it is recommended that you follow the advice of your doctor. It is needed that you chew food well and use a small eating meal. After surgery individual may have pain after eating. Also, individual get diarrhea, acid reflux after eating too much or too fast. After surgery, an individual need to more chew the food, otherwise, he might feel sick. Individual, after surgery food can move too fast through the stomach and intestine. This situation called “dumping syndrome”. In dumping syndrome situation an individual can get nausea, weakness, sweating, cramping, and diarrhea. So, individual needs that he doesn’t eat high sugar or high-fat foods because these make the dumping syndrome more badly. After surgery, an individual might not get all the nutrition he needs due to less eating. So, after surgery, a doctor may provide a prescription for using vitamin and mineral supplements. So, this article is related to “bariatric surgery definition” and the individual who wants bariatric surgery, it is needed and expected that he contact a dietitian, psychiatrist, internist, and a bariatric surgeon before surgery.